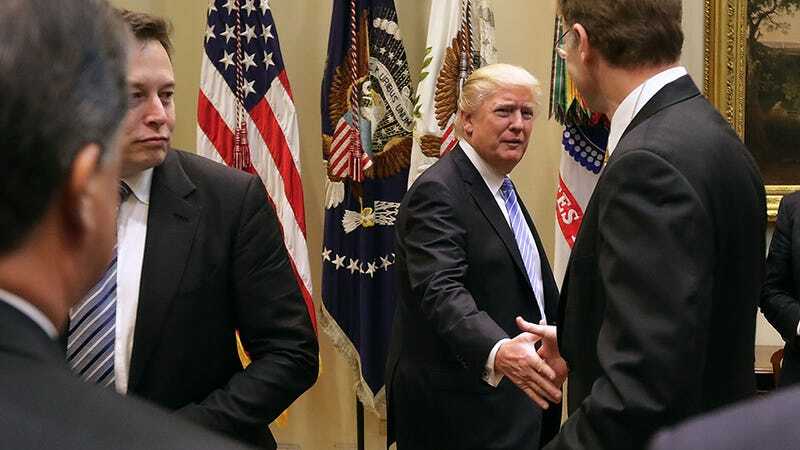 Elon Musk really wants to believe that he can work with Donald Trump. As a member of the new administration’s economic advisory board, Musk thinks he has an inside track to be a good influence. And now he’d like your suggestions for amending the president’s unlawful executive order on immigration. This is great, Elon. We know that you’re scheduled to meet with the president on Friday because your fellow adviser Travis Kalanick said that was the case in his statement, yesterday. It’s well known that Trump doesn’t like getting bogged down in details so if Elon really wants to get the commander-in-chiefs attention, we highly suggest keeping the proposed amendments simple. Just print this out and present it to him. It’s very important that this be printed. Trump likes his info in hard copy format unless it’s on Twitter. The subject line on the memo should look just like this: Protecting the Nation From Foreign Terrorist Entry Into the United States. That’ll take care of any particulars we’ve overlooked. Those are our suggestions for tightening up this illegal violation of countless people’s rights—make sure to send yours along. Keep it simple, even a well-played GIF could hold the answer to this complex problem.